ww2dbaseThe heavy casualties incurred during the grueling Italian campaign placed a strain on the American democratic political machine and displeased American generals. At the objection of British counterparts, American Lieutenant General Jacob Dever's 6th Army Group (consisted of Lieutenant General Alexander Patch's US 7th Army, General Jean de Lattre de Tassigny's French 1st Army, and the 1st Allied Airborne Task Force) shifted its attention to southern France in Operation Dragoon (originally named Operation Anvil). The American planners wanted Dever's 887-ship and 2,000-aircraft landing operation to compliment the Normandy campaign, which the slow-moving Italian campaign was not able to do. ww2dbase"[w]e no longer had any need of the port of Marseille and the line of communication leading northward from it. Troops from America could come in via Brittany." ww2dbase"The attack through the south of France was far removed geographically from the troops in northern France that there was no tactical connection between them." ww2dbase"The troops to be used under General Devers in the southern invasion would have more effect in winning the war by driving forward in Italy and into the Balkans and threatening Germany from the south than they would by pursuing the originally planned line of action." ww2dbase"Our entry into the Balkans would encourage that entire region to flame into open revolt against Hitler and would permit us to carry to the resistance forces arms and equipment which would make the efforts of these forces more effective." ww2dbaseHowever, Eisenhower overruled the British objections and decided to carry out the operation; he was said to be partially distrustful of the British intentions for a Balkans entry into Europe, for that he thought Britain may have had imperialistic ambitions. This incident of Eisenhower overruling British opposition was yet another signal that the United States was not only coming to age as a dominant world power, but she was taking over Britain's place as the more influential member of the alliance. ww2dbaseEisenhower argued for taking Marseille for the fact that the Germans had already sent a portion of the area's defenses northward to reinforce the Normandy region, leaving Marseille vulnerable and free of the threat of German demolition. 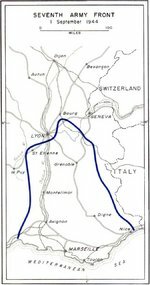 The elimination of German forces in southern France in general would give the Normandy landers much needed relief on their southern flank, granting much safety for a strong supply line. ww2dbaseOn 15 Aug 1944, the landing troops sailed from Corsica surprised the German and Vichy French defenders at the French Riviera (Cavalaire-sur-Mer, Saint-Tropez, and Saint-Raphaël beaches). Within the first two days thousands of men and vehicles were transported ashore, and the port cities of Toulon and Marseille were under Allied control by the end of the month. With the intelligence information provided by local French Resistance, the Dragoon landers were able to connect with Patton's American forces near Dijon by 15 Sep.
ww2dbaseMain German defenders in the southern France region were of General Johannes Blaskowitz's Army Group G, which was consisted of General Kurt von der Chevallerie's 1st Army and General Friedrich Wiese's 19th Army. Army Group G's ranks were thinned as elements were sent to northern France to counter the Normandy invasion, which provided lighter resistance for the Allies than originally expected. In a month's time, the thinned German defenses fell apart in southern France, effectively dissolving the Vichy-French government. The successful Allied operations in southern France also inspired a revolt by resistance fighters in Paris. ww2dbaseOperation Dragoon included a glider landing (Operation Dove) and a deception (Operation Span). 23 Jun 1944 Churchill, with misgivings, gave in to pressure from the Americans and sanctioned operation Anvil (the proposed US-French invasion of the south of France). Churchill called this a "Bleak and sterile exercise". 2 Jul 1944 General Sir Henry Maitland Wilson (Supreme Commander, Mediterranean) received orders from London, England, United Kingdom to organize the invasion of Provence, France. The name of this operation was changed by British Prime Minister Churchill to "Dragoon". 20 Jul 1944 French troops began withdrawing from Italy in preparation for the invasion of southern France. 21 Jul 1944 The French Expeditionary Corps and the US VI Corps began to be withdrawn from the front lines in Italy to prepare for the invasion of Southern France. 15 Aug 1944 Operation Dragoon, the invasion of southern France, began. On the same day, Saint-Tropez, Var, France was captured by the 15th Infantry Regiment of 3rd US Infantry Division. 15 Aug 1944 USS Marblehead bombarded Axis positions near Saint-Raphaël, France. 16 Aug 1944 USS Marblehead bombarded Axis positions near Saint-Raphaël, France. 17 Aug 1944 USS Marblehead bombarded Axis positions near Saint-Raphaël, France. 23 Aug 1944 US troops from the north and French troops from the south met near Bordeaux, France. 24 Aug 1944 Allied forces liberated Cannes in southern France. 26 Aug 1944 French troops captured Tarascon and Avignon, France. 28 Aug 1944 The German garrison in Marseille, France surrendered to French forces. 29 Aug 1944 French troops captured Montélimar in southern France. 3 Sep 1944 US and French troops reached Lyon, France. Hindsight indicates that the invasion hardly drew any German reserves from the main front and the retreating formations slipped into position on the left flank of the German forces defending their western frontier. Montgomery voiced the general British opinion that Anvil was one of the great strategic mistakes of the war, the withdrawal from Italy of the US Divisions and the entire French Expeditionary Force needlessly prolonged that campaign so that the Russians reached Vienna first and had a free hand in the Balkans, with vital post-war repercussions. Do you have a photo of aHiggins boat (LCVP)being hoisted out of the wster near San Rafael zafter Southern France invasion? My father was in the invasion on southern France as a member of the USN UDT doing explosive ordinance disposal. Could you direct me to any reference material that discusses their efforts during the invasion? If only 13000 men came ashore, who drove the extra 5000 vehicles out of the 18000 that were put ashore? to William P Kenda- Would love to talk with you about your father. Actually,the Navy's demolition men were from Navy Combat Demolition Units although frequently inaccurately called UDT ( exclusively served in the Pacific). Check out More Than Scuttlebutt on the net. To larry: There were roughly 150,000 troops who were deployed, only about 13,000 in the first few hours of the assault. My Mother and my grandmother Lorette Rousset and Marinette Rousset lived in St. Tropez during the German occupation and I have heard stories of Operation Dragoon all my life. They were warned by towns people the night before the invasion to vacate their home and to take their important papers. There was gunfire exchange between the Americans and Germans. My mother,Grandmother and neighbors who had gone to higher ground, hid in a barn type structure which they realized was unsafe. They were crouching in tall grass and as dawn approached they heard planes and saw American Paratroopers in large numbers floating to the ground. The Germans had mined the port and detonated the mines. I have so many stories of the occupation in St. Tropez....too many to tell. My uncle was kia on 10/1/1944 near the town of Epinal, France. would this have been a part of Operation Dragoon? Would appreciate any info about any battle or action listed. thank you.